When I was a kid, I had one of those sets of colored crayons with a hundred different colors in it. It seemed like it had every color in the world in it. But like many kids, I always wondered if there was another color out there somewhere. I think I can convince you that there are colors out there that you can’t see. I’m not talking about just a different shade, tint or mixture of those 100 crayons — but some totally different visual experience. That color that Terry Pratchett describes as “octarine” in “The Color of Magic”. I think many of us had that thought about that one time or another as kids. But then you grow up and pretty soon come to realize that the visual spectrum — what you see in a rainbow — represents all of the colors that we can see. Sure, there are darker and lighter versions, desaturated colors like pink — but basically red, orange, yellow, green, blue, indigo and violet are all there is. Infrared and ultraviolet are beyond our ability to see…so that’s it. The whole lot — all 100 crayons and a bunch of in-betweens — but no more bright, solid colors. You can also mix colors — and wind up with brown, teal, pink and so forth — but still, no actual, dramatically new colors there either. So this is all there is? It’s useful to think of light in a way that’s analogous to musical notes. So pure color is like a single note played on some musical instrument, and mixed colors are like chords. White light contains all of the colors — and is like down all the keys on a piano at once. Black is the absence of light — so it’s the optical equivalence of silence. To stretch the musical analogy a little further, imagine that Red light (which has the lowest frequency of all the colors that we can see) is like playing an ‘A’ on a piano, yellow is ‘B’, green light might be a ‘C’, aqua/sky-blue is ‘D’, pure blue light is an ‘E’ and violet is ‘F’. ‘G’ and up is ultraviolet and the notes below ‘A’ are infra-red — and those colors are invisible to us. But this isn’t what we see. Our eyes basically only detect three colors — red, green and blue, corresponding to three kinds of “cone-cells” in our retinas. We also have “rod-cells” that detect the overall brightness — but that’s just revealing different shades of a single color…dark through light. So if we see a pure red light (an ‘A’ in our musical analogy), then our red-sensitive cone cells send our brains a strong “RED!! !” signal and the green and blue-sensitive cones are more or less silent. If we see green light (analogous to a ‘C’ note) then the green-sensitive cells send signals and the red and blue cells shut off. And blue causes the blue cells to go nuts and the reds and greens to shut off. Three primary colors — three kinds of cone cells — roughly equally spaced across our imaginary keyboard. But what if we see a color between (say) red and green? Checking our rainbow, that would be yellow — and it’s like playing a ‘B’ in our musical analogy. We don’t have any yellow-sensitive cones — so how do we know that we’re seeing “yellow”? Each cone cell responds most strongly to the color it’s best at seeing, and progressively more weakly for colors further away in the spectrum. An individual cone cell can’t tell your brain exactly what color it’s seeing, only “Very-red…kinda-red…just-barely-red…not-red”). So when you see “yellow”, the red cone are telling your brain: “kinda-red!” — and the green cones say “kinda-green!”. But the blue cones are saying “definitely not-blue!” because blue is far from yellow in the spectrum. When we see yellow light, it’s as though our brains are “hearing” a B musical note as a chord of A and C rather than as a single pure note. But because our eyes work the way they do, our brains are wired to see that optical “chord” of red and green as a single note — which we’ve chosen to call “yellow”. It’s interesting that we’ve given yellow its own name - separate from red and green — but that’s just a cultural thing. In a physiological sense, yellow is just “reddish-green” or maybe “greenish-red”. We see the colors between green and blue in a similar way, but linguistically, we generally don’t think of the color between the two as a ‘different’ color like we do with yellow. Technically, the name of greenish-blue/blueish-green is “cyan” — but “aqua” or “sky-blue” are other common terms. Cyan is halfway between green and a pure, darker blue — so our brains get “not-red, kinda-green and kinda-blue” (a chord of C and E in musical terms) and we see “cyan” — which is really the pure tone: D.
Interestingly, some human cultures say that green and blue are different shades of the same color (“grue”, I suppose). In Arabic, the sky is described as “green” rather than “blue” — which seems odd to English speakers — but since the sky is really cyan — there is no reason to prefer “green” over “blue”. In Vietnamese and many African languages there is just one word covering the entire spectrum from green, through cyan and into blue! 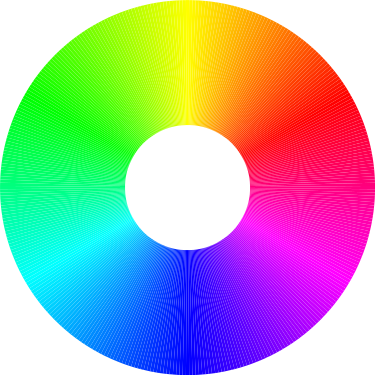 On the other hand, in greek, there are six different ‘colors’ between green and blue that are considered as separate as red, green and yellow in English. In English, we might (rarely) use the word “Indigo” to refer to that ultimate, purest blue. Violet is interesting…we’ll come back to that later. But it all works — right? Aside from the way our cultures name colors — this system works great. We can see all of the colors from red through to blue (and violet) and there are no gaps in the rainbow that we can’t see or distinguish. So (unless you happen to be color-blind) you have perfect color vision — and there are no ‘extra’ crayons missing from the box…right? How TV and Computer Screens Work. I want to discuss a bit about how television, cellphone and computer screens work — because it makes this a little easier to understand. 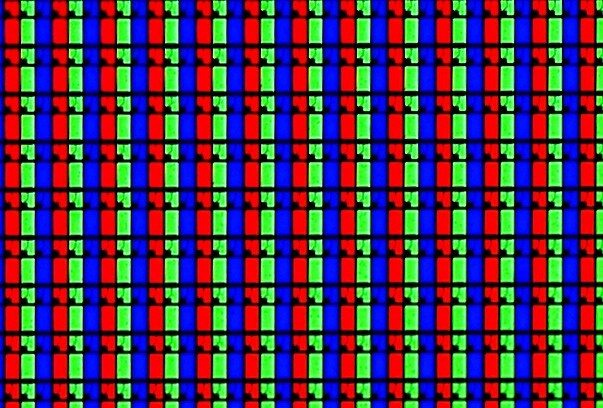 An LCD monitor, displaying “white”. So these screens don’t really display yellow light at all. They display a mix of red and green. It’s like you’re trying to play a ‘B’ on a broken piano that only has A, C and E keys — so when you need a B, you have to press A and C together and hope for the best! Doing that clearly wouldn’t fool our ears — we can easily hear the difference between a two-note chord and the single note between them. But because we only have three kinds of cone cell; doing exactly that fools our eyes completely! Because we only have red, green and blue-sensitive cone cells, we can mix up red, green and blue light in the right proportions — and trick our eyes into seeing all of the colors in the rainbow. It’s just as well that this is true or we’d probably still be watching TV in black and white! 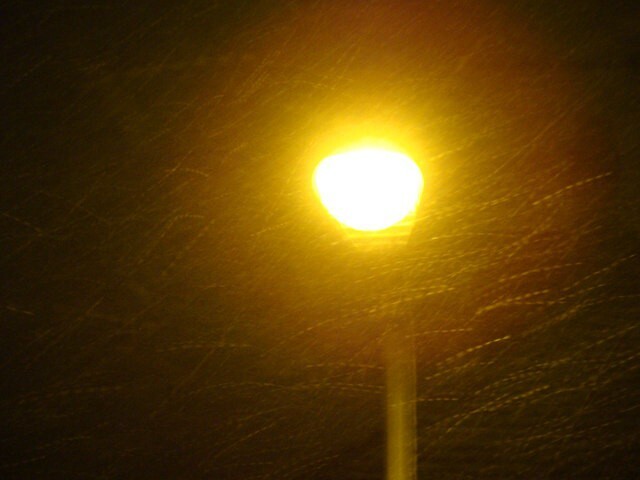 Specifically, suppose you see one of those old-fashioned sodium street lamps — the hot sodium vapor emits just one frequency of pure orangey-yellow light. It’s a pure note somewhere between ‘A’ and ‘B’ (red and yellow) in our analogy…a B-flat. Our red cone cells send out a “slightly-reduced-red” signal and our green cells say “fairly dim green” — and our brains say “Orangey-yellow!” — so everything works out OK.
Take a picture of that streetlamp with a digital camera, display it on your cellphone and although the color still looks orange to you, you’re really seeing a mix of red and green light…an ‘A-C’ chord. These two different patterns of light look the same because our retinas send the same signals to our brains either way. What this means (and it’s kinda profound) is that there are two very different colors that we call “yellow”. 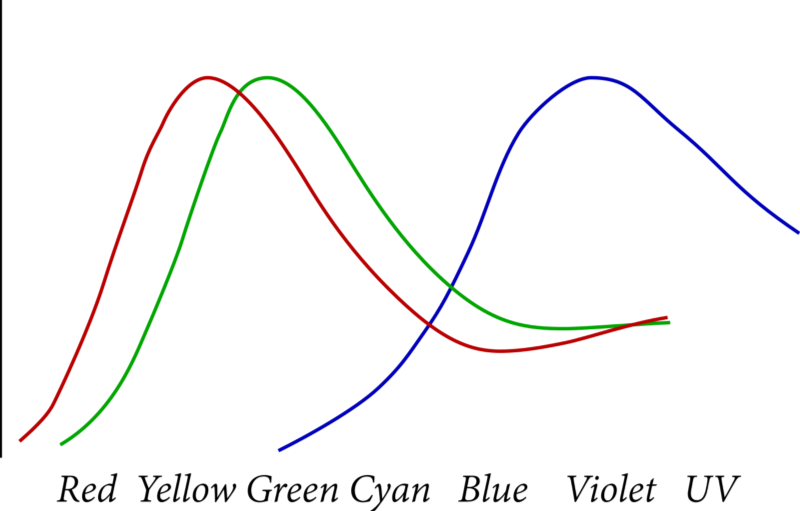 There is one that’s pure light of just one frequency halfway between red and green on the spectrum — and there is a “chord” of red and green that looks exactly the same. We literally cannot tell them apart with just our eyes. Think about that…two completely different colors…look exactly the same. Well, OK — but so what? If yellow is halfway between red and green — and we’re seeing a mixture of red and green on a TV screen, how badly wrong are our eyes? Not really a big deal, surely? Just how different is the red-green ‘chord’ that your TV produces from that true yellow sodium light? We can’t ever know directly, so we need some means to intellectually grasp just how bad this is. We know that our ears care about the difference. If you replace all of the ‘B’ notes in a song with chords of ‘A’ and ‘C’ — the result is horrendous…but does our vision also suffer? Yellow kinda looks a bit reddish and a bit greenish — and certainly cyan looks decidedly blueish and greenish — so maybe our paltry 3-cone eyes aren’t so bad after all. How about we ask a mantis shrimp? Colorful little guys aren’t they! BIG eyes too! For some reason, these shrimp have twelve different kinds of cone cell in their retinas instead of just three like us pathetic humans. Eight of those see colors in the same range that we do. So for a Mantis shrimp, yellow-from-a-sodium-lamp and yellow-from-a-cellphone would look completely different…they’d certainly produce different electrical signals from the retina into their little brains. So I’d say that there is very likely to be a difference. Almost certainly, a mantis shrimp would see color television as a totally weird set of colors, with no yellows, only reddish-greens, no cyan, only greenish-blue! We don’t even have words — or adequate combinations of words to describe what these little guys actually see. They have way more than 100 colors in their box of crayons. OK…getting to the point here! How can we get a gut feel for how different the halfway-between-red-and-greenkind of yellow and the red-green-chord version of yellow would look to a mantis shrimp? Fortunately, I think I’ve found a way! Think about this: Let’s consider what a mixture of red+blue light looks like when you display it on a computer screen…an ‘A-E’ chord in our musical analogy. That’s the color that we call “magenta” or “shock-pink” — the color of Barbie-doll boxes. When we are presented with red-blue-chord light — we see this vivid purplish-pink. How different is that from the color halfway-between-red-andblue? Well, the note that’s halfway between A and E is C…and halfway between red and blue is green. Yep…green. So we know that “halfway-between” two colors is very, very different from “chord-of” two colors…as different as magenta and green. Unless of course, you believe that magenta is a shade of green. 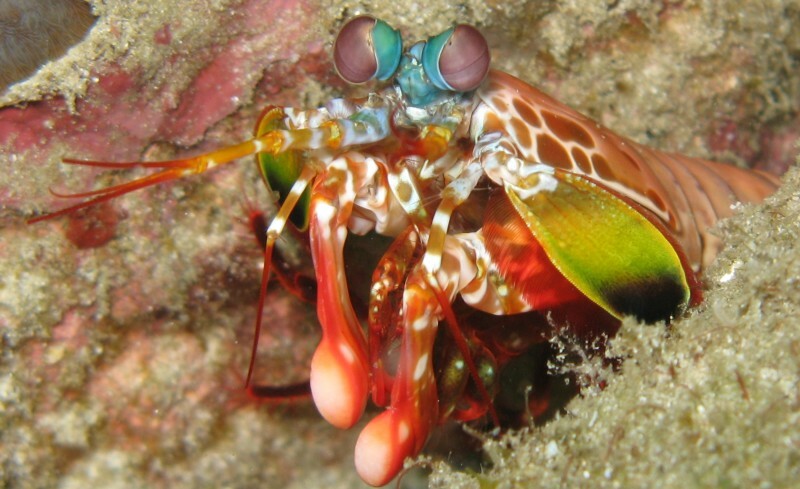 Human color vision is unbelievably poor — and if you’re a mantis shrimp, you’ll need a lot more crayons in that box! And Magenta is a shade of Green…arguably. But that does leave us a few loose ends to tie up. Over on the right hand side — about where the color violet is, our red-sensitive cone cells are actually slightly increasing in sensitivity. So they are a little bit sensitive to the light frequencies that we call “violet” — which is weird. So if you see “violet” (an ‘F’ in our music-analogy), you get response from both the blue and red cells (albeit more weakly in red) — which produces a color that’s not unlike the shock-pink “magenta” you get from a full-on red+blue chord. This complicates the story quite a bit — but it doesn’t diminish the fact that we only get three distinct signals from our retinas concerning color — and that means that we’re missing an awful lot of subtle (and not so subtle) color combinations. This idea that red cones are sensitive to violet light at the very top end of the spectrum as well as the red light at the very bottom end tends to make our perception of color a “circular” thing — where blue fades into violet, violet fades into magenta, which then fades back to red. Many times you’ll see color displayed on a ‘wheel’ — and yet in physics text books (and rainbows) it’s a linear thing with ends that don’t joint together well. The circularity of color is an artifact of our eyes that’s entirely due to that little ‘bump’ at the end of the red cone’s response curve, not a physical thing. Your turn to do some work! 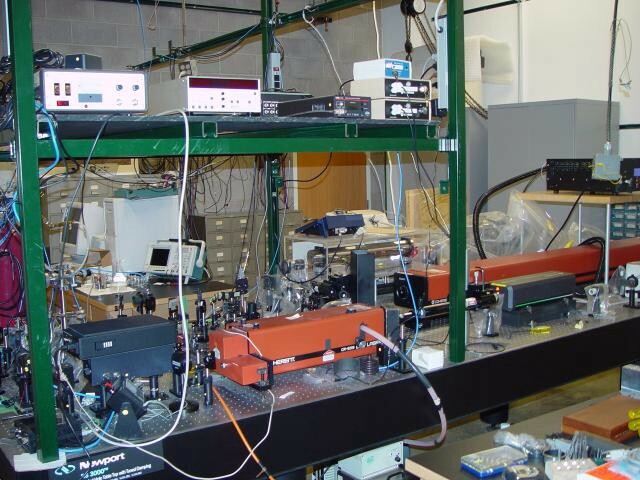 Because we can’t properly discern color with our eyes, scientists use big expensive machines called “spectrometers” to measure all of the frequencies that make up the complex “chord” that is a beam of light. Those machines cost a small fortune, but you can use an old CD or DVD (preferably one with a silvery backing, not the gold-colored kind) to do much the same thing. If you tilt it at the right angle to incoming light, you can see the colors that make it up. Sunlight produces a complete rainbow — a computer screen (in a darkened room) that’s showing pure “white” light gets split into red, green and blue (although there is a little overlap between them, so you see small bands of yellow and cyan). It’s interesting to examine the colors you find in other light sources — LED house lights, indicator LED’s on electronics and LED Xmas lights, incandescent lamps and CFL lamps all produce interesting results. Armed with nothing more than a CD, you can see that the light from an old fashioned sodium streetlamp lights up the entire CD with one solid orange color but a photo you take of it breaks up into red and green stripes. 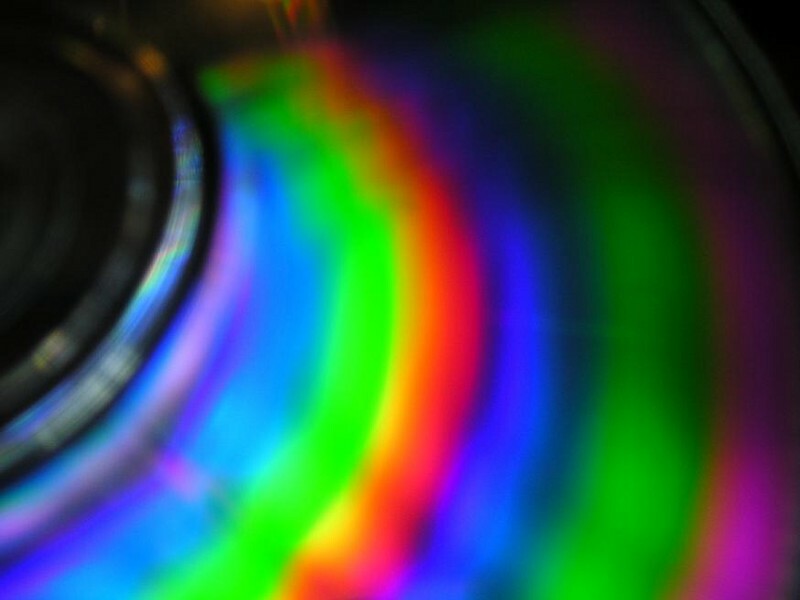 The CD lets you “see” colors as they truly are.